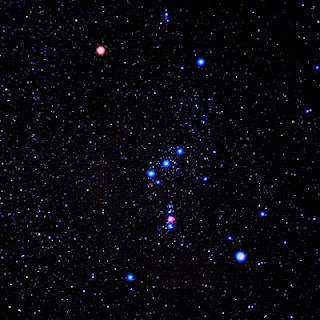 Meanderings and Reflections: When Orion walked with me . . .
With earphones playing 'Chicken Fried' by Zac Brown Band and brisk walking down the joggers park, I looked up and behold! who is walking along with me - ORION, the hunter. Now did I ever mention that I am absolutely fascinated with star-gazing. When times seem tiring and eyes need some soothing, I look up and spot the few constellations I know. Orion is one of my favourites. I just like to spot the hunter with his sword and other paraphernalia. I can gaze and gaze without any thought nor action and get lost in the multitude of stars. While we were children, we were quite amazed that the moon followed us wherever we went. I always used to ask my father: 'How come the moon knows where I go? It is always following me.' My dad would make up different answers to pacify the ever-springing questions and I got immense joy by looking at the sky at regular intervals and spotting the moon follow us. This was the same feeling that I experienced today while spotting the Orion right above me. Fascinated as always by the hunter, I found that this constellation is visible throughout the world. Wow!!! That someone at the same time as me would be looking at Orion made me feel connected with every being and life-form. Foolish as it may seem to think that Orion or the moon is keeping pace with me, it also gives a strange camaraderie with the universe. Giving science and common sense a break for a while, it felt wonderful to be walking along with Orion. Now the song in my radio went on from playing 'Chicken Fried' to 'It's Raining Men' by Geri Halliwell. I looked up. As strange it may sound, Orion went from being above my head to the left of me. So long we were walking beside each other but all of a sudden (!!!!) the hunter decided to move a bit. Hmmmmm. I just think he did not like me listening to 'Its raining men' when he was around!!! I did miss you and was just about wondering where did you disappear. How nice to have you come over and sprinkle lovely words. I do know that you also love star-gazing and am so glad that you see the hunter always during clear nights. Oh! how I love him!!! Quite amazed by your extensive knowledge. It would be great to go star-gazing with you! I always used to think that it would be great if someone who knew about stars was there when I needed to know more about them. Its a lovely wonderful world up there. Would like to know more such things. Thanks for taking the time. Susan, it seems we have more in common than we realize. Stargazing is also a favorite activity of mine. And when I was a young child, my father used to take me out to the desert so we could stargaze far away from light pollution. And he taught me how to read the sky. And ever since, I have been fascinated by outer space. I even wanted to be an astronaut, at a certain time in my life. Imagine that! So I totally relate to your sense of "oneness" with the stars. I feel it too. And it makes me feel like I'm no longer an inconsequential drop in the bucket, or in the universe. Beautiful thoughts, Susan. Very beautiful and joyful and grand! I know nothing about stars but I like staring at them and at the moon. I sometimes visit a blog named Astropixie written by a young female astronomer (It got the Blog of Note, and that's how I came about it.) and read news on certain astronomical phenomena. The picture in your post is lovely, and so is the description of Orion, the hunter. The first thing that comes to mind talking about stars is the rhyme we were taught in our kindergaten "Twinkle Twinkle little star, how I wonder what you are............." and I still wonder....... Although I don't know anything about stars or the constellations.... The sheer beauty of them enthralls me... just looking at the tiny dim lights in sky has a soothing effect on the heart...... lovely post suzy, as always I am your fan.... love you my dearest. I know. we do seem to have so much in common. It makes me happy that many find themselves in me and I in them. Your experience with your father was lovely to read. i can imagine little Nevine with eyes full of wonder gazing at Orion and other constellations. Thanks for sharing your memories. It does give a special feeling. Your first comment here. Glad! I don't find astronomy very interesting as there is a lot of technical stuff which goes way above my head but sky, stars and moon individually -- I can get lost in them. Thanks for your kind words. It is much appreciated. Glad that you dropped by here. I know that its wonderful to feel that we are a part of this whole chain of life and action. Mountains of peace to you. Long time but am sure happy to read your comment. I love you and you know that. "How I wonder . . ." As you have said, even I wonder almost everyday. There are certain aspects of this universe (I think all of them) are so much beyond our comprehension and stars definitely rank the highest in that list. haven't stargazed for a long while... this has given me the will to do it again! I wanted to go to Space Camp so badly when I was young. And I used to make up stories about the moon from my bedroom window. It's so easy to get lost in different worlds, isn't it? We are both stargazers and wanderers, Susan. And I hope the moon and stars continue to enthrall and enchant us for the rest of our days. I enjoyed your personal recollection very much. I have only once seen a sky filled to the brim with stars. Every inch was filled. Not much into astronomy, not sure which is Orion or hunter! Bless you dear. Oh twinkle twinkle little star... Ok just wanted to be different with my response. :) I loved your post! I, like you and all your other lovely followers have a fascination with the stars. As a child I spent many summers at my Grandparent's summer home in the woods of Wisconsin. I would walk out into the fields at night riding on top of my Dad's shoulders and stare in wonderment at what floated above me. Today, I live in a tiny subdivision away from the bright lights, surrounded by forests and farm land. I hadn't looked up for years until my family moved out here. One night while walking with my husband I did, and it all came back to me! I haven't stopped looking up since, marveling at how small we really are. It is humbling. I definitely knew that you would be fascinated with the stars as well. 'Coloniser of mars!!!' sounds very interesting. All the best for that. Long time!!! Please do go out and gaze at the stars and write a lovely poem on that. Yes, its very easy to get lost and that is the best part. I am sure the sky will enthrall us as we travel in life's path. Thanks for stopping by to comment dear one. Been quite some time. Hope you are well and happy! Even without knowing the constellations, one can be awed by the magic of the sky. I am sure you will agree to that. Isn't it? Bless you as well. Joy and peace always. You remind me of Nat King Cole! The place of your dwelling sounds fascinating. Wow! It is definitely humbling and wondrous to look up, get lost and find that we are all in the same state of flux and motion. Thanks for coming by. I value your visits. Long time. I see Orion almost everyday. These days you just disappear. Hope all is going fine. Hope you are baking some more cakes!!! Loved the post, the picture is beautiful too !! How nice to see a comment from you. Tell me about star gazing!! Its just lovely to get lost in the night sky. We all share a kindred spirit in star gazing. How nice! We are part of everyone as everyone is part of us. Lovely to have you over here. How nice that you thought the moon followed you! All of us share stories, don't we? It's lovely to know that. Bless you dear one. Thanks for coming by. Nice that we share so many traits. Partaking the joy of life!! I THANK YOU ALL FOR TAKING THE TIME AND WRITING YOUR INSIGHTS. PARTAKING OF THE CUP OF LIFE HAS NOT BEEN MORE INTERESTING. JOY AND PEACE IN ABUNDANCE!!! Just great! I love star gazing and the Orion is really fascinating. One of the stars in the constellation is Betelgeuse some 800 light years away. And to think that what we see today is the light that started out 800years ago just gives me the goose bumps.Another constellation that fascinates me is Taurus with Aldeberan forming the 'Bull's eye'. It is great that you could bring such good memories to so many people. How nice to read you comment. I was left reading all the comments over again! Yes, it is definitely wonderful when people share their memories and experiences. We all feel as if we are different yet similar in many aspects. It would be lovely to star gaze with you as well. Shall we go for it since both of us are in Chennai??? "How come the moon knows where I go? It is always following me"
Orion never fails to wonder us. I am glad that you enjoy stargazing as well.